Pierside Grill and Famous Blowfish Bar is a Florida beach bar located in Fort Myers Beach. Discover this great Florida beach bar. Hours: Open Daily 11:00 a.m. until 11:00 p.m. 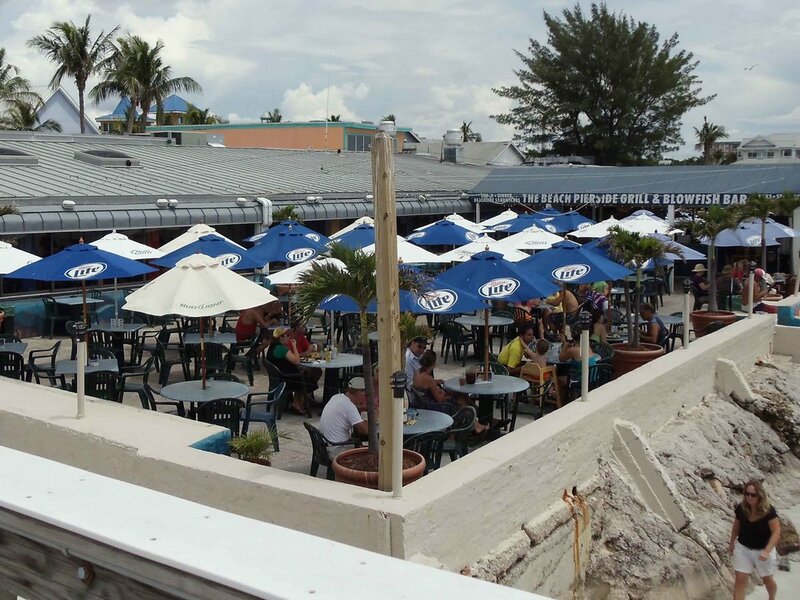 The Beach Pierside Grill and Blowfish Bar have a fantastic location in Times Square section of Ft. Myers Beach. Ft. Myers Beach is a great place to bar hop. There are a lot of good Florida beach bars, and many of them are right on the beach. Walk down the Pier, and you will see Pierside on your left. This Florida beach bar is assessable by water. Just bring your boat and to the Pier, drop anchor and walk to shore. But if you are a beach person instead of a boater, find a spot on the beach to relax and enjoy your day. You can get your food and beverages from Pierside. That's better than dragging a cooler, don't you think? For food you can choose anything from seafood to burgers. They also serve "Almost World Famous Beach Bread." The Blowfish Bar features all the favorite frozen drinks, and they have created a few of their own. They have "High Tide" or happy hour, Monday through Friday from 3:00 p.m. to 6:00 p.m. Order a cool drink, and sit back and listen to the live entertainment. This Florida beach bar has live music every day from 1:00 pm to 5:00 pm and then again 6:00 pm to 10:00 pm. The views from Pierside are tremendous. You can watch boaters, swimmers, sunbathers and fishermen. Ft. Myers Beach is home to a lot of Florida beach bars and interesting crowds. Stay and watch the fun. This is a good starting point if you are walking the beach and hitting all the beach bars. Beware of hot sand, though! !